Superior Heavy-Duty Aluminum Railing provides an innovative, attractive, and safe solution that makes as much sense on a 13th-floor balcony as it does on a front porch. By utilizing classic design elements with two key modern twist, Series 9000 railing is flexible to numerous project types. All exposed picket screws are covered to create an unsoiled look to your railing. Meanwhile, our advanced pocket posts eliminate the need for unsightly brackets in level applications. When fully assembled, 9000 rail creates a sturdy, modernized design unmatched by competitors. Superior Aluminum will manufacture each order custom to specific needs of the project, saving installation time and money. All series 9000 rail utilizes code approved components and is built to standards established by the ADA, ICC, and OSHA to ensure all systems are secure. A variety of styles are available for series 9000 railing, including 2-line or 3-line railing as well as customized style per customer request. Any style can be manufactured at any height desired. Don't see any photos in our gallery that fit exactly what you need? Let us know and we might be able to help! Superior Series 9000 Assembled Picket Railing is also available in ready-made 6-foot sections that can be cut down on the job site. These sections provide the same quality of a fully customized job but offer a significantly quicker lead time. 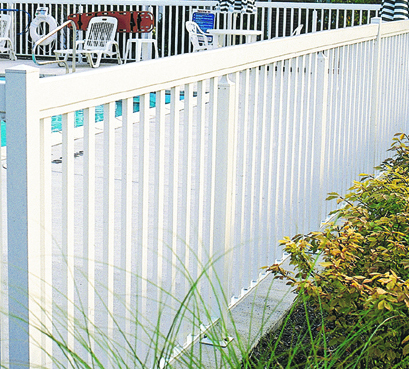 Also available is Superior Aluminum Series 9900 Heavy duty railing. These railing systems embrace the same advantages stated above but showcase larger top rail and larger pickets to emulate the natural look of wood railing while maintaining the maintenance-free qualities of aluminum. Machined Posts tidy up your project by removing brackets on level applications! Projects can be fully customized to fit any need you may have!